I don't see them, have they not been set up yet? I mean, it's not like once you having something in low Earth orbit you can stick a gassy astronaut on the outside after Chili Night and fart it anywhere in the solar system. Look down further... Since it's filled with "fan designs" it's been moved to the "fan" category. That'll be a lot easier for "official" types to avoid it altogether then to avoid cross-contamination, right? Every time a grognard comes to realise the game can't survive purely on his dog-eared copy of the Warrior Trilogy, duct-taped CityTech boxed set and personal sense of spite and has taken a tack of mild concern for the future marketability of the game...an angel gets its wings. That was the general idea. We also wanted to more clearly divide up the various sections and knocked around a whole slew of different layouts and breakdowns of the categories. Get the fan done stuff all in one category, get the universe discussion separate from rules discussion, get all the official stuff like announcements and rules up top/first. Oh, no issue. As long as you've gotta do it, it may as well be "whole hog". Nice to have 'em back! I approve of the new organization! I like it actually. I hope it pre-empts some of the huge amounts of post pinning. Will there be new guidelines on what's appropriate for "Non-Canon Units"? 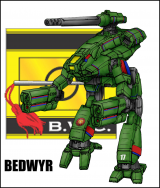 I ended up running a game there based on a unit I built in that forum. Thanks! I'll be posting a tank for review later on today.